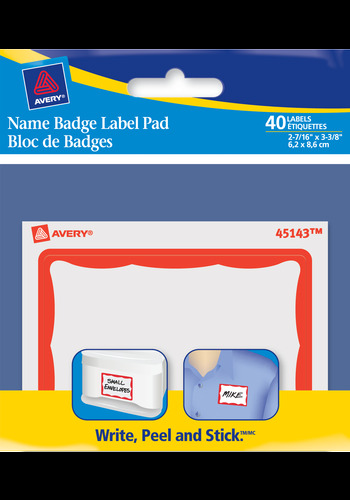 Get any event off to a great start with Avery® Name Badge Label Pads. These labels come stacked in a handy pad that fits in the palm of your hand so you can take it anywhere you go. Just write on the label, peel away from the pad and stick. Get any event off to a great start with Avery® Name Badge Label Pads. These labels come stacked in a handy pad that fits in the palm of your hand so you can take it anywhere you go. Just write on the label, peel away from the pad and stick. Labels are designed to adhere firmly but remove easily, and are suitable for most fabrics. You can also use them for organization, storage and more. For simple, fast and professional name badges for any event. Label Size 2-7/16" x 3⅜"
Compact and versatile labels right when you need them. Labels are stacked in a handy pad that fits in the palm of your hand so you can take it anywhere you do. Just write on the label, peel away from the pad and stick.